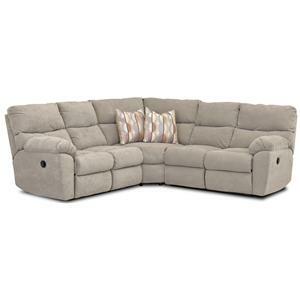 Upgrade your living room or family room with this comfortable casual reclining loveseat. This two seat upholstered pieces features a high plush split back and pad over chaise seats, offering luxurious head-to-toe support. Soft pillow arms frame the piece, and accent pillows add a touch of color, completing this cozy style. 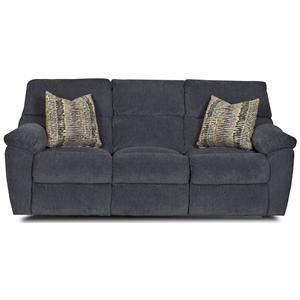 The Odessa Casual Power Reclining Loveseat with Plush Pillow Arms and Accent Pillows by Klaussner at Hudson's Furniture in the Tampa, St Petersburg, Orlando, Ormond Beach & Sarasota Florida area. Product availability may vary. Contact us for the most current availability on this product. The Odessa collection is casual and comfortable, offering the perfect solution for your living room or family room. 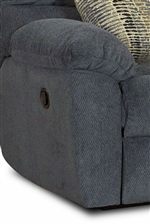 These plush reclining pieces will support you from head to toe, with a high tufted back cushion, full chaise seat, and soft pillow arms. The Odessa collection is a great option if you are looking for furniture in the Tampa, St Petersburg, Orlando, Ormond Beach & Sarasota Florida area. Browse other items in the Odessa collection from Hudson's Furniture in the Tampa, St Petersburg, Orlando, Ormond Beach & Sarasota Florida area.